We spent our Christmas extended weekend taking a day trip to Al Ain. We have already been to this small but beautiful city in the UAE when we visited the Jebel Hafeet mountains. 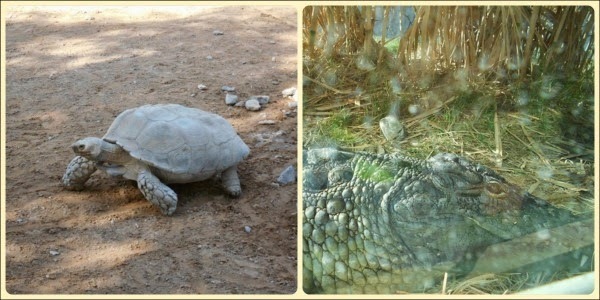 That time, we didn't stop by the oldest and largest zoo, Al Ain Zoo, but we always intended to go back. The Al Ain Zoo was set up in 1968, and is involved in the conservation and breeding of many endangered animals, such as the Arabian Oryx pictured below. The enclosures in this zoo are huge, and that's exactly how I think zoos should be. There are a few cages where necessary, but many are open enclosures, and some are glass walled. The zoo is huge - all 900 acres of it, so a stroller for kids is a must, and they can also be rented. We didn't take ours, but bought tickets for the Zoo shuttle, which is a golf cart carrying you through the zoo via four stops. This is an excellent option for families (and costs AED 30 per adult). They also have a free train which rides around the park, but has only one stop. For a more luxurious ride, there's an Ahlan service, which has some impressive looking vehicles! 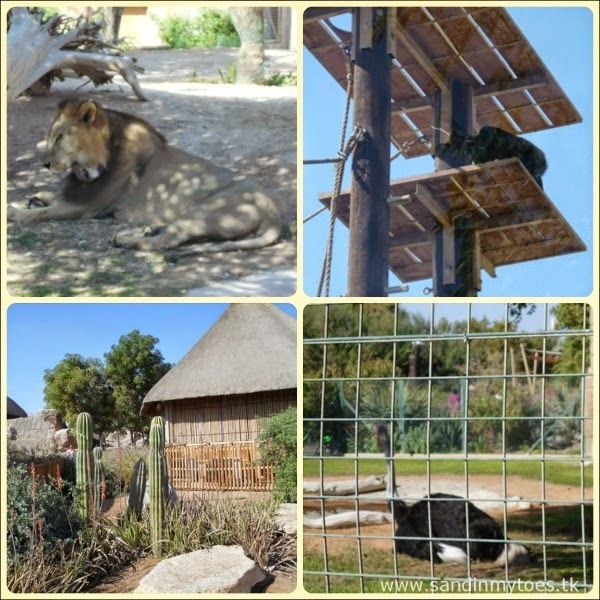 The first exhibit on entry is the Big Cat House where we got to see lions pretty close, and white tigers. The African Exhibit is right next to it, and we saw some chimpanzees walking the ropes there! I like how the landscaping in this area has been done as if you are in the African Savannah! The ostrich we saw didn't oblige us by standing. We also saw leopards and hyenas. Little Dude was pretty excited about visiting 'the jungle' (he insists on calling it that), and really looking forward to feeding the giraffes. The giraffe enclosure is the largest, but we got lucky in attracting one giraffe towards our carrots (bought for AED 30 at the feeding counter). When it actually came to feeding it, Little Dude shied away, probably scared by its long tongue! I spotted a rhino far away in this enclosure, but not any zebras, though the zoo supposedly has them. We also didn't see a hippo as we had read about on their website. Just next to the reptile area, we saw giant tortoises, which were quite a few. The alligator enclosure was really nice because you can see them from above, and also from a tunnel below, which gives you an underwater view. The alligator we saw was pretty close to the glass wall there! There's also a Nocturnal House at the zoo, but it was so dimly lit, we could hardly see the creatures. That's how they like it, I guess! Next, we moved on to an open area where we settled for lunch. There are lots of restaurants and cafes in the zoo. The best thing about Al Ain Zoo is that it's so large and open, and there's a green area for people to relax in. 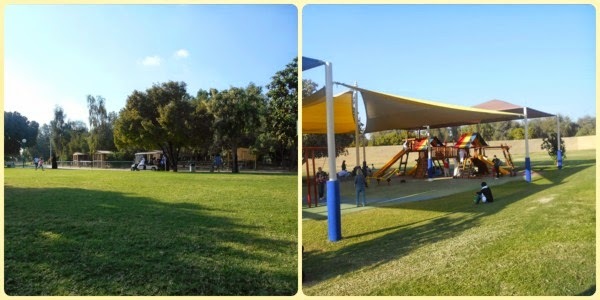 There's also a well-maintained playground for children that Little Dude spent some time in despite having walked so much! Our last stop was the Children's Zoo, where farm animals like sheep, turkeys, ducks, goats and camels are found. They also have a large cage where you can feed budgies. Before entering this part, we crossed a toy shop where Little Dude loved the stuffed zebra and tiger! It was a long day, and certainly fun! 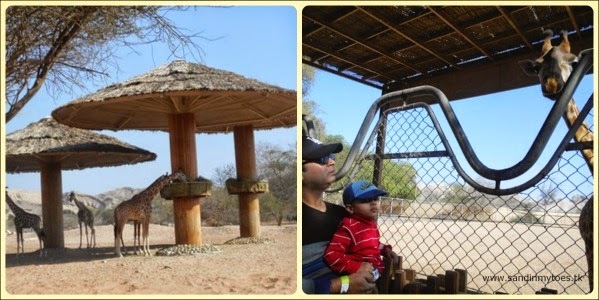 If you're in Dubai, I would recommend visiting Al Ain Zoo with your family. They also have an expansion project for 2015, so I hope there's more interesting stuff to go back for. Compared to the Emirates Park & Zoo we went to in Abu Dhabi, this one is much more spacious - but both are great for a family day out. 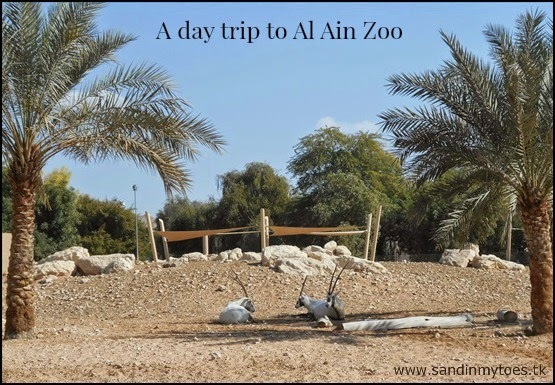 It takes between 1.5 to 2 hours by car from Dubai to reach Al Ain Zoo. There are road signs that are easy to follow. Al Ain Zoo also hosts special events, check out their website for details. The best time to visit it is during the winter months, because even in December, it was quite sunny! 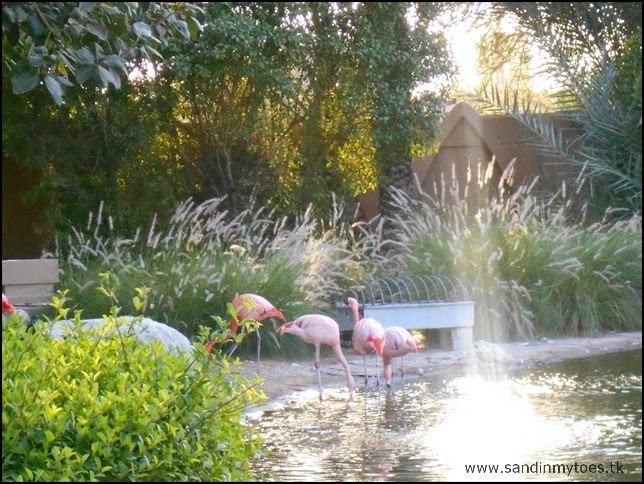 Right next to the entrance is the Flamingo pond, where we some of these lovely birds before we left. What an amazing trip!!! I LOVE LOVE stuff like this and thank you for sharing. that Zoo looks amazing! I love zoos that have large enclosures rather than cages. Wow! What an amazing day out! What a really super day out! .. i love that the giraffe enclosure has the lower bits of fencing so you can get so close to them and they can stick their heads out! That looks like a beautiful zoo, although a little too close to the alligator for me! Look at all that wonderful sunshine! It's a massive place and brilliant that they have so much to ensure suitable environments for the animals too. It was really huge, so a lot of walking for us! Thanks, Jamie. The giraffe enclosure was the best! Yes, pretty close, but it wasn't a big alligator really! They have done a good job of caring for the animals. Yes, it was a very sunny day! The animal enclosures were all very well made. True, big spaces make the best zoos! It looks like you had a brilliant time on your road trip. Zoos are Z's favourite! Our little guy loves it too! Yes, it was almost like a safari! Looks fabulous. How wonderful to be able to fee the giraffes!